Don’t you love a good, simple chicken recipe? 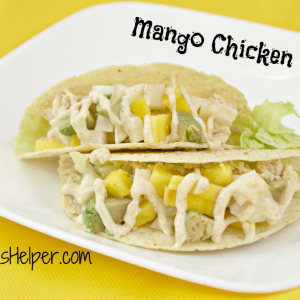 I sure do – especially for those busy weeknight meals! 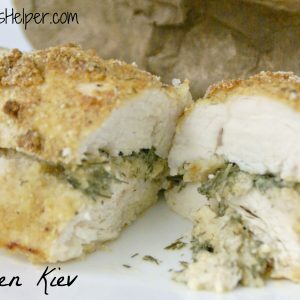 This Chicken Kiev is super moist, and the flavor from the stuffing is just the ticket for a delicious meal that the whole family will love! You can do the chicken one of two ways: 1. you can do it traditionally and slice a pocket in the chicken to stuff the filling in or 2. you can just have really thin breasts and put the filling between two of them. Your choice. In a bowl, blend the butter, dill, chives, salt and pepper. Use half the mixture to stuff the chicken breasts, pinching the sides of the chicken closed. Take two bowls: in one put the eggs, in the other put the breadcrumbs. Season with salt and pepper. Dip the chicken in the eggs and then the bread crumbs. Place the chicken breasts on a sprayed (or lined) baking sheet. Bake for 30-45 minutes, or until cooked through. Removed from oven and top with the remaining butter herb mixture. My family loves fruit, especially the kids. Not so big on the veggies, but that’s another story. It’s difficult, though, to keep fresh fruit for too long (you know how easily apples roll to the back of the fridge then get yucky? ), plus then you have to cut it freshly which takes time. 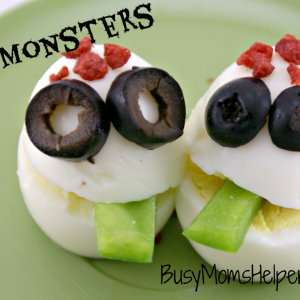 I don’t always have time before snack to get it ready….I just want it to go from cupboard to plate easy and quick! So dried fruit is a common snack at our home, but it is so EXPENSIVE! Plus, all of those additives that my kids really don’t need. Because of this, I’ve been dreaming of getting a dehydrator…..a dream that has yet to come true, but oh well! 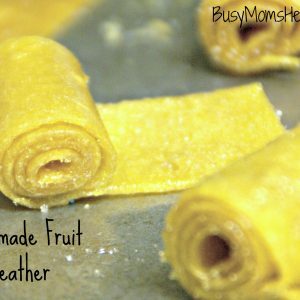 Now that I’ve learned how to make homemade fruit leather without a dehydrator, I can keep it more healthy AND easily stored and accessible. LOVE IT! Preheat oven at 150 degrees, or as low as it will go. Place good parchment paper or a baking mat on a baking sheet. Cube or slice the fruit. Place fruit and sweetener in a blender. Blend until smooth. Pour mixture on baking sheet. Bake for 6-8 hours. You can tell it’s done when the center of the mixture isn’t sticky. Let cool, then gently remove from pan. Use a pizza cutter or knife to cut it into strips (or squares, whatever you prefer). Roll up, if desired. I don’t like maple syrup. There, I said it! Even as a kid, I always used fruit syrup or jelly with things like french toast because I didn’t like the maple syrup. Not the taste, smell, anything. So when I decided to make these French Toast Bites, I figured it was a good breakfast for my hubby and kids, and I’d find something else for me. Or would I?! Flash told me to at least try it, so I did and it was AMAZING! I had more than anyone, I admit. It was just so sweet with a pleasant crunchy coating. An absolutely delightful way to start the day! Wonder Woman has already asked me to make them again, and I’m more than willing! In a medium sauce pan, bring the maple syrup and brown sugar to a simmer. Open the can of biscuits, cutting each into fourths. Roll each piece into a ball. Place the biscuit balls into the syrup mixture. They will puff up, so be sure to leave room! Cover and let them simmer until they’ve doubled in size, turning occasionally to cover all sides with the syrup. Remove the balls from the heat and allow to cool. Mix the nutmeg, sugar and cinnamon in a bowl. 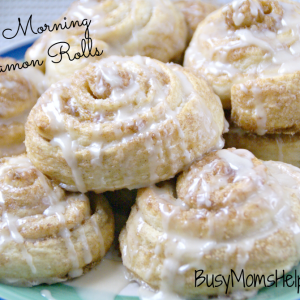 Carefully roll each ball in the sugar mixture so it’s nicely coated and crunchy. 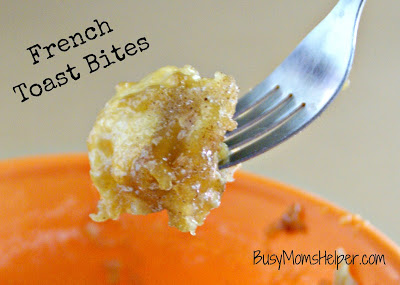 Place the bites into a bowl, and drizzle with the remaining syrup mixture. Enjoy! Okay, I know this isn’t EXACTLY a recipe, but it’s one of my kids’ favorite meals so I thought I should still share it. It started in elementary school. Now, I don’t know what type of lunches you had when you attended school as a kid, but one of our rotating menu items was potato bar. It was one of my favorites (along with the pizza, of course)! When I still lived in Utah, I would often volunteer or sub at the local elementary school (which is the exact school I attended 1st and 2nd grade), and they STILL had this yummy meal. 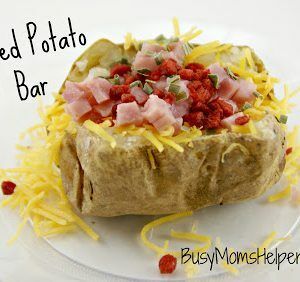 It got my craving going, so I decided to do our own family potato bar at home. Obviously, you need some baked potatoes: wash, poke holes in the potatoes, and bake at 425 degrees for about an hour to an hour and a half, depending on potato size. 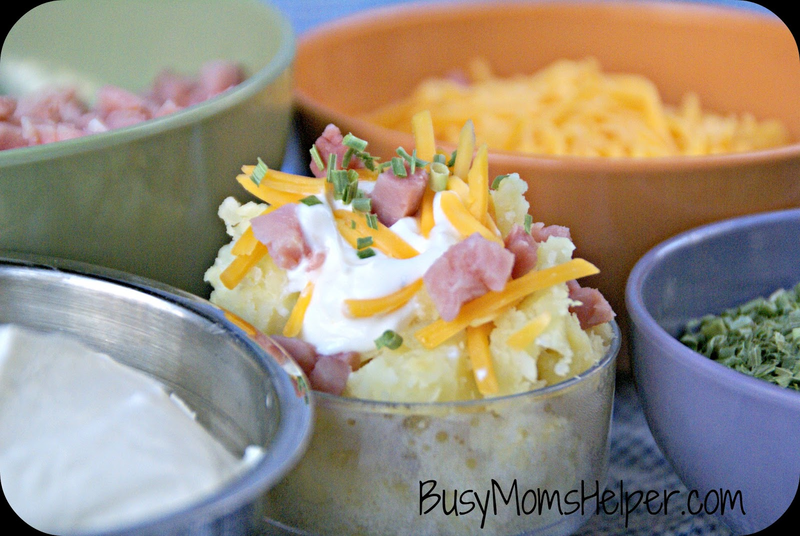 Put the toppings in different serving bowls (little ones work great for us), and let each person select their own so they actually ‘build’ their own potato. The kids think it’s the funnest thing ever! I’m sure there’s tons more toppings, so just base it on what your family likes. Ours is usually the cheese, sour cream, ham bits, chives, and sometimes olives and bacon bits. Have fun with it! Prepare the taco shells according to the package and set aside. In a bowl, mix the lime zest, 1 tbsp. of the lime juice, mayo, cumin and cayenne pepper until well blended. Place about 1/3 cup of the sauce into a resealable plastic bag, secure and set aside (this will be used to drizzle over the tacos). Add chicken to the remaining sauce and mix well. In separate bowl, combine the jicama, mango, cilantro, salt and remaining lime juice until well mixed. In each taco shell, place some lettuce, then the chicken mixture, jicama mixture and avocado. Trim the corner of the sauce-filled bag and drizzle over the tacos. Anywho…it was his birthday in February, and of course I couldn’t make him a chocolaty dessert. 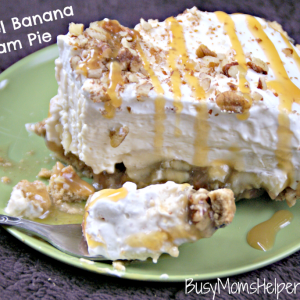 Therefor, I had to give this yummy sounding Caramel Banana Cream Pie a try! Oh my goodness, it almost makes me give up chocolate (almost, don’t worry). It’s just bursting with smooth, creamy flavor. Love it! Beat the cream cheese, sugar and vanilla in a bowl until well blended. Mix in 2 cups of the whipped cream. Set aside. Pour 1/4 cup of the caramel topping onto the crust, spreading to cover evenly. Top with layers of 1/4 cup pecans, bananas and cream cheese mixture. Spread remaining whipped topping over top, and sprinkled with the rest of the pecans. Refrigerate for 2 hours. Drizzle with remaining caramel topping. I believe it’s perfectly possible to be a BUSY momma, but also a lazy one. And guess what? There’s nothing wrong with that! Since we’re so busy, there’s just certain tasks and occasions that we need to be ‘lazy’ on – like when fixing up dinner on a busy weeknight. 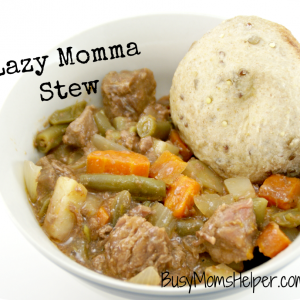 But don’t worry, you can still feed your family an incredible meal without all the time and stress with this Lazy Momma Stew – a super easy stew recipe for those nights that something’s just got to give. In your slow cooker, first place the beef, then veggies. Sprinkle the top with tapioca, salt and pepper. In a bowl, mix together tomato sauce and water, then pour over the other ingredients in the slow cooker. Top with brown sugar over everything. There you have it – a super easy stew recipe you can whip up on those busiest of nights (man, those seem to happen a lot, don’t they?). Okay, I’m not a cold-loving person…..and I grew up in northern Utah. Winters just aren’t my friend. That’s one of many reasons we moved to Texas (we have yet to see how we like the HOT of summer here), to avoid the wintry snow and cold. The one good thing about cold weather? 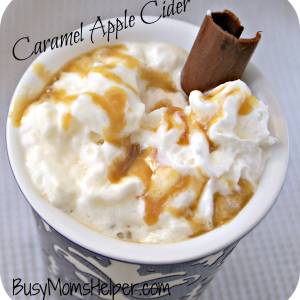 Curling up with a nice cup of Caramel Apple Cider. I love it! So when my friend mentioned making it IN A SLOW COOKER, I thought ‘perfection’! With a touch of caramel, it ALMOST had me missing the snow back in Utah. Cook the apple juice and cinnamon sticks in the slow cooker on High for about 4 hours. Remove the cinnamon sticks prior to serving. Stir in the Caramel sauce (about 1/2 jar). Be sure to serve in heat-proof cups, because it will be hot! Top with whipped cream and a drizzling of caramel sauce. Notes: I went through a whole jar of caramel sauce for one batch of caramel apple cider, but my friend says she only uses half total. So base it on your preference. Obviously, I love caramel! Also, after about 4 hours I turn it to ‘keep warm’, so I can just get another glass still hot when I want throughout the day. If the cup has been sitting awhile, stir it before drinking, as the caramel and cinnamon tend to separate. For those of you who don’t know, we are currently in a small three-bedroom apartment. After moving to Texas, we decided to save money while building our new home here, so thought squeezing in here wouldn’t be a huge deal for six months. I admit, I’m really struggling with this, though! Not only is it cramped, but half of our stuff will stay packed until we move into the house. My kitchen is sad; it’s smaller than the one I had in college! So lately it’s all I can do to bring myself to cook new things, just because the lack-of-space is wearing on me. 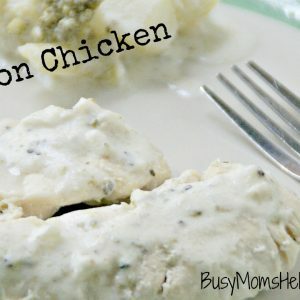 This tasty Lemon Chicken is one meal I did try new, and it was a hit with my lovely aunt Janie! Place chicken breasts and broccoli in a sprayed baking pan. Combine all other ingredients in a bowl. Pour over chicken and broccoli. Bake for 30-45 minutes, or until cooked through. So get creative and try something new in your own kitchen – like this lemon chicken! So we went to Disneyland last month with the ENTIRE family (jealous? Just wait, you may not be). I’m talking my hubby, kids and me, plus my parents, four sisters plus two brother-in-laws, two nieces, and my nephew. Crazy, I know! We all rented a large home nearby the park, and it was fantastic. The rooms were all a different Disney theme, there was a huge Rapunzel mural on the wall, it was just darling. Plus, our own pool and hot tub! We seriously were planning this vacation since last summer, we were that excited! So you would think it would’ve been the perfect vacation, right? Oh, no, ma’am! My family got the flu. For pretty much the entire vacation. We spent two days driving there, and enjoyed the beach one day. So far, so good. Then our first day at the park we make it to mid-afternoon when it hits. Superman starts throwing up….right as we’re getting off the Jungle Cruise ride. So we go back to the house, unsure what’s going on. That night, Batman starts in on it. Days 2-3, Batman and then Green Lantern take turns…..even if we tried the park because we think they’re recovered, someone would end up covered in yuckiness. Day 3-4, my turn, lucky me! Day 5 is Flash and Wonder Woman. Then two day drive home. So not the best vacation ever, especially after getting excited for it almost a year ahead of time, but it definitely could have been worse. We got to see family, have SOME fun at the parks with the kids, the beach was good, and we took turns staying at the house with the sick ones and the others going to the park. My family was also extremely sweet and helpful, taking Wonder Woman with them often so we could handle the boys, and my mom even stayed with her at the house Friday morning so we could have a bit more time on our last day. I’m sure if/when we go again, I’ll be pointing out in remembrance “that’s where so-and-so threw up”. Awww, memories! Spread the frosting on the bottom half of each Oreo. Put two white chips for the pant buttons. Love it! 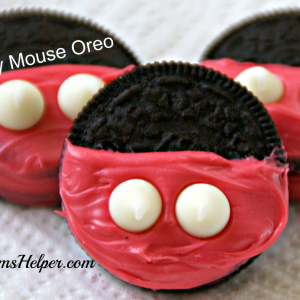 Notes: you can also use milk chocolate chips as ears at the top of the Oreo. I just happened to be out at the time.